Please allow me to introduce you to the California based artists and writers (and their Filipino friends) who graced our fair city with their presence. 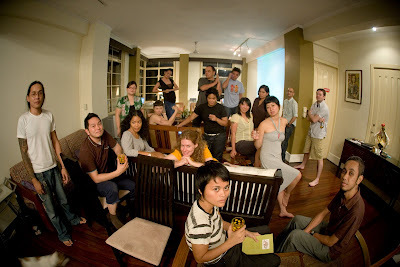 They all made their way here to the Philippines for a group show/artist talk/exchange called "Galleon Trade", organized by the intrepid Jenifer Wofford. Currently on exhibit at Green Papaya Art Projects and Mag:Net Katipunan and High Street, these artists truly raised the bar when it came to artistic collaborations. Not only were they talented, eloquent, and organized, but amazingly, they were all charming as well. They truly tickled Manila pink. It was a privilege hosting them at The Living Room and I certainly hope that this isn't the last time we'll see them around these parts. Pseudo Vanity Fair photograph above done by Juan Caguicla. Entrance is free but donations are more than welcome. I need not lament that Manila's scene lacks edge. Only one year after the lovely Domina Jane showed us how to tie things up at the Living Room, Sensei Shinobi73 will show us how to tie things down over at Robinson's Apartelle. The event will be limited to only thirty (30) slots. Confirmations and prior payments absolutely necessary. Email tetsubo73 @ yahoo.com for payment details. And only email tetsubo73, my site does not take reservations.